It’s that magic time of year when internships are granted and job offers are finalized. 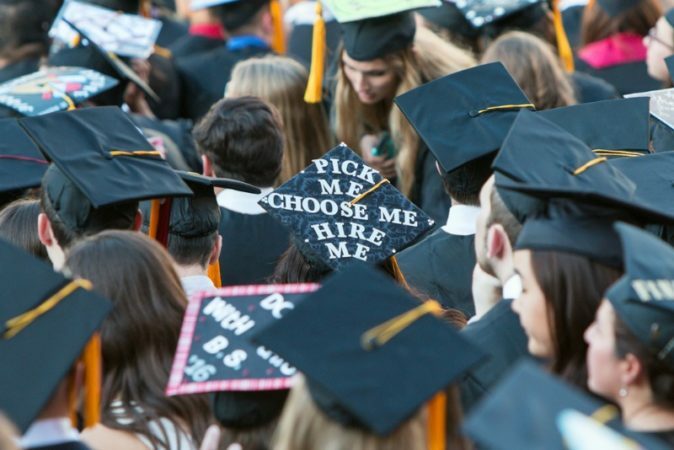 The recent college admissions scandal highlights the unnatural focus in today’s America on getting into the right schools to get the right jobs. And, getting the right job continues to be highly competitive as not all corporations or organizations hire recent college-grads. In order to give your child an edge, here are 5 reasons why I will hire your child. 1. He/She reaches out to me directly. I constantly hear from former colleagues advocating on behalf of their children for internships and informational interviews. It’s certainly true that an “in” such as a parental relationship and overall networking can get your child’s resume to the top of the pile. And, even though the child is frequently as accomplished as his or her parents, I want to hear from the child — NOT the parents. Is the child really interested or are the parents the ones who are interested? It’s fine for the child to reference a relationship with his parents as part of the introduction, but it shows initiative when the child reaches out. I want a candidate who is used to advocating for himself – not letting his parents manage everything as I’m hiring the child and not the parents. 2. There are no typos in the resume/cover letter. I have argued with my colleagues on this point many times but a typo in a resume or cover letter shows me at minimum, that a candidate isn’t detail-oriented. And, I simply don’t buy that the “no typo” red flag doesn’t apply in a world where much of our work output is digital and easily correctable. If you can’t proof your resume or cover letter, how can I trust you to put out quality work that is professional and appealing to customers, employees, partners, all the key stakeholders, etc — much of which is digital. You can’t resend an email once it’s out. Moreover, mistakes in coding can proliferate throughout a product’s lifecycle. Many times I’ve received a professionally designed resume — from the trendy fonts and photo to the thoughtfully worded accomplishments — only to receive an illegible cover letter along with it. It’s crystal clear that the applicant didn’t produce his resume and certainly didn’t devote the time into constructing a cogent email. I’ve also pushed back on recruiters who have advocated for their “perfect” candidate in a highly competitive employee’s market. What does it matter if there is a typo — the candidate has the right mix of a very competitive skill set – what’s the problem? She can still do the job, right? Um, no. Again, typos signal lack of caring to me. Next. 3. Your child is an athlete or in the military. Your child doesn’t HAVE to be an athlete to get hired BUT collegiate athletes typically make high-performing employees. As an example, you can train an employee on the day-to-day job requirements but you can’t change work ethics. Athletes already have that dedication and even discipline to practice something over and over again until they get it right. Not surprisingly, they are usually team-oriented and know how to work with others toward a common goal. In the workforce, this may mean taking the lead as the situation dictates as well as providing support. Student athletes are also usually far ahead of their student counterparts on time management. Typically collegiate athletes have had to juggle classes with practice, conditioning, travel, and the games themselves so they are highly organized and know where to prioritize spending their time. Finally, student-athletes demonstrate resilience. If they’ve been successful at playing a sport through college, these kids failed a lot throughout their athletic careers. As a result, they know how to pick themselves up and move on — a skill that lends itself well to constructive criticism and professional development in the workplace. As a coda to this point, students who have spent time in the military such as ROTC, possess many of these same characteristics and are also very appealing. 4. Your child has intellectual curiosity. There’s no way a college graduate will start a job knowing how to do everything required. I understand that as a given in hiring college grads in the first place. Thus, I’m not necessarily looking for experience — rather I want qualified candidates with a hungry mind. I can train them on what I need them to know with the assurance that a candidate with intellectual curiosity is capable of thinking beyond the role she is interviewing for. Curious people are natural learners since they crave knowledge and new experiences. These qualities result in employees who are eager to grow and expand their role and can potentially add value to my business — even at the entry level. It’s hard to fake this trait — you either have it or you don’t, despite getting direction from campus career centers to ask lots of questions on an interview. Asking open-ended questions is always a good sign —also good follow-up and contextual questions on the traditionally asked questions on culture, working environment, etc. Finally, thinking through your answers demonstrates to me you’re not scripted and are even considered in your replies. 5. Your child took the time to do some research. This last reason falls out of the “intellectually curious” point. If your child is indeed interested in the job, the role and his employers, he will go the extra mile to dig into the hiring manager’s background and credentials. It’s also easy to see the difference between a candidate who looked up your LinkedIn profile and name-drops your university versus someone who did a bit more in-depth digging on the company and management team. Stalking someone and spewing out a bunch of facts you’ve discovered is never good. But looking for ways to build rapport with a hiring manager by understanding their philanthropic interests or passions can spark a genuine conversation. For example, I once had an internship candidate who found an old profile of me that talked about my need to take a chocolate break every day at 3:00 pm. Our interview ran until 3:30 pm at which time as a parting gift, the candidate presented me with a small bag containing two chocolate truffles. I had already mentally hired this candidate because of her thoughtful questions, her confidence and passion, but this added touch sealed the deal. « What Happens When Your College Graduate Doesn’t Have A Job?